William Eggleston, the 66-year-old Memphis photographer, and Townes Van Zandt, the deceased Texan musician and songwriter, have a lot in common. Both came from wealthy Southern American backgrounds. Both spent long careers developing steadfastly individual voices, though their most famous work came from the same period: the early 1970s. Both Eggleston and Van Zandt achieved idol status among devoted cult audiences, though both led lives that were elusive to friends and fans alike. 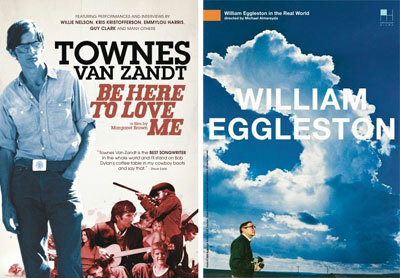 Eggleston and Van Zandt are the kind of figures that documentaries love to tackle. In turn, these are the kind of documentaries that can come to define our view of such figures for years to come. Be Here To Love Me's most striking moments are excerpts from John Szalapski's Heartworn Highways, a film that Margaret Brown, in a tasteless and inexplicable decision, fails to credit. The words “Nashville, 1974” appear over the clips, leaving the viewer to believe this is stray footage Brown herself excavated from some dusty closet. In actuality, the DVD of Heartworn Highways, a documentary chronicling the burgeoning outaw country movement, was released in 2005, and the scenes in which Van Zandt appears are more revealing of Townes' life -- his humor, pain, charisma, talent — than the entire contents of Be Here To Love Me. It's hard to say which is more disappointing: that those already interested in what makes Townes so unique and extraordinary have been given a portrait that could just have easily been about Kurt Cobain, or Tim Hardin, or Hank Williams, or Elliott Smith, or that this is the movie that will serve as an introduction in the years to come for those who know nothing about Townes. In the film's climax, Almereyda presses Eggleston to acknowledge photography as a means of making the intangible concrete. Eggleston furrows his brow. “I never thought about it that way,” he drifts off, mumbling slowly. “The trouble is…whatever it is about pictures — it's just about impossible to follow up with words. They don't have anything to do with each other.” It's the moment at which we empathize completely with Eggleston, and realize how much our own experience of watching, and getting to know, Eggleston is implicated in the film's conclusion. This is the kind of complex, highly charged and personal revelation documentaries aim for — the kind of moment that Be Here To Love Me, with its stacks of talking head interviews and plagiarized Heartworn clips, simply can't reach. These films are most enlightening seen together. They reveal much about their subjects, but even more about how we talk about such subjects. With movies like Unforgivable Blackness: The Jack Johnson Story, and No Direction Home: Bob Dylan, not to mention the dozens of True Hollywood Stories airing on TV every day, the documentary biopic is now doing more to shape our view of famous figures than ever before. For as long as we're interested in learning, and talking about, our heroes, movies like these will matter. William Eggleston In The Real World is proof of how eloquent, and relevant, such conversation can be, but if Be Here To Love Me is the best of what we want to say about someone like Townes Van Zandt, maybe it's better to not talk at all.